I was featured in the Ipswich Star's Weird Ways To Keep Fit in 2018 article! 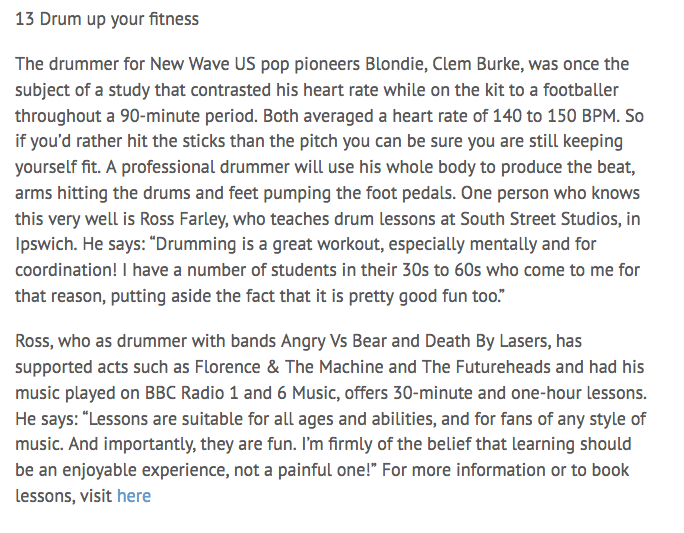 Ross, who as drummer with bands Angry Vs Bear and Death By Lasers, has supported acts such as Florence & The Machine and The Futureheads and had his music played on BBC Radio 1 and 6 Music, offers 30-minute and one-hour lessons. He says: “Lessons are suitable for all ages and abilities, and for fans of any style of music. And importantly, they are fun. I’m firmly of the belief that learning should be an enjoyable experience, not a painful one!” For more information or to book lessons, visit here.